Three adjectives that describe you: Joker, hilarious, and confident. Favorite activities: Music, food ,and working out/ playing sports. What do you think will be the most difficult part about living inside the Big Brother house? I guess missing and not having communication with family. Which past Big Brother cast member did you like most? Victor Arroyo! He played every challenge like it was his last and won his way back in multiple times. Do you have a strategy for winning the game? Finding a loyal person or two. Use my social game and let my physical game play show at the end more than beginning. Don’t let the other houseguests know I’m a powerhouse from day one. My life’s motto is… Everybody dies but not everybody lives. Live every day like its your last. What would you take into the house and why?iPod. Fun facts about yourself: I wet the bed until the age of 10, which helped me be skilled at laundry at an early age. I have a blue nose pit bull who’s my world and I treat him like my child. A man who can admit prolonged bed wetting and cherishes a blue nose pittie? He just may be my favorite this season. That's until he opens his mouth, of course. He seems too nice. I'm afraid we'll find out week two that he stalks his ex and has a restraining order. I don't hate Bed Pisser Shitfat yet. We'll see. My life’s motto is… Live every day like its your last. Blah blah blah. If he says YOLO, I'm out. Not quite. Just public intoxication and indecent exposure. He's cute. I kind of like him. I'm thinking of Mark from last year so here's hoping for some good ol' ugly crying! My preseason favorite. I don't even mind his rap sheet. He was probably drunk and needed to pee. Like most of us as we recap this damn show. Yeah, that indecent exposure was probably public urination rather than hide in the bushes with nothing but a trench coat on. Yep, peeing in the alley. But apparently, not quite enough in the alley. I like him so far; he is easy on the eyes and ears and appears to be sane. I could see him going far. Admitting to bedwetting either means he is not too full of himself, OR it could mean he thinks so much of himself that he is prideful about being able to admit it.We will figure it out. Personally, I'd keep that info quiet and use it as a killer security question/answer. All sorts of icky feelings when he proudly stated that his students are stunned by his body and swoon when he walks in the classroom. 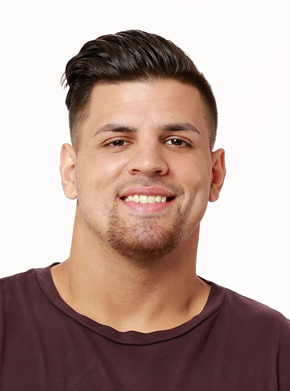 Let's hope we can move past that quickly as you reveal more redeeming self-reflections, Fessy. He's gorgeous. Much more attractive on tv than in photos. He's the first hammy to give me screaming thigh sweats. Wowza! Yeah, I thought he was pretty damned handsome, too... there are a LOT of guys this year who -- at least visually -- I am finding pretty damned handsome!